Albaanish, Baarle, Croitish, Portiugish, Serbish, Spaainish, Turkish as Ookraanish. T'ad ny kiare çhengaghyn oikoil 'syn Elveeish na Germaanish, Frangish, Iddaalish, as Romansh. Cha nel staydys oikoil ashoonagh agh ec tree jeh ny çhengaghyn shen: y Ghermaanish, y Rangish, as yn Iddaalish. Ta'n Ghermaanish ny çhengey ghooghyssagh da 64% jeh sleih ny çheerey (4.6 millioonyn), 20% (1.5 millioon) nyn Vrangisheyryn, 6.5% (0.5 villioon) nyn Iddaalisheyryn, as ny sloo na 0.5% (35,000) nyn Romansheyryn. Ta'n ard Germaanish (Deutschschweiz) ny lhie ayns twoaie as meanagh ny çheerey, yn ard Frangish (Romandie) 'syn eear, as yn ard Iddaalish (Svizzera Italiana) 'sy jiass. Ta lught loayrit ny Romansh beg foast ayn Grischun 'sy niar. 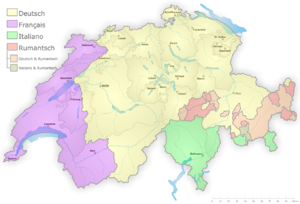 Ta ny cantoonyn Fribourg, Berne as Valais nyn gantoony daa-hengagh. Ta Grischun ny chantoon tree-hengagh dy oikoil. ↑ (Baarle) The Federal Constitution of the Swiss Confederation, article 4. Feddynit er 2009-04-30. ↑ (Frangish) "Diversité des langues et compétences linguistiques en Suisse. Feddynit er 2009-04-30. ↑ Lüdi, Georges; Werlen, Iwar (April 2005). Recensement Fédéral de la Population 2000 — Le Paysage Linguistique en Suisse (Portable Document Format) (Frangish, Germaanish, Iddaalish). Office fédéral de la statistique. Feddynit er 5 Jerrey Geuree 2006.